Generally I’m not overly fond of novellas because there doesn’t seem to be enough character or plot development. This sweet short story is an exception. In just over a hundred pages, I fell in love with Amelia and Stephen and thoroughly enjoyed their romance. Two years ago, on what should have been her engagement announcement, Amelia’s fiance jilted her and eloped, leaving her humiliated. To make the situation worse, her mother created a huge scene, increasing the embarrassment and scandal. Stephen, Lord Brooke, her almost fiance’s best friend does his best to help smooth over the situation. Amelia decides to withdraw from society and has lived quietly since. One night, Stephen is badly beaten for not paying back a gambling loan he took from a loan shark. A friend brings him to Amelia’s home, knowing her mother is away. The two of them have always had a friendly rapport, but during the intimacy of Amelia caring for him, it escalates to attraction. The rake Stephen decides that he needs to reform, and that Amelia is the one for him. These two were just perfect for each other, and it was a delight to watch them fall in love. 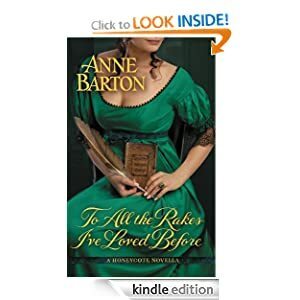 This book was uplifting, and it makes me want to read more by Anne Barton.